“We’re all for extending unemployment insurance,” McConnell said. “The question is, when are we going to get serious” about the surging federal deficit. The answer is: when the Republican party is a very, very, different party from the one it is today. This has been another edition of Simple Answers to Simple Questions. 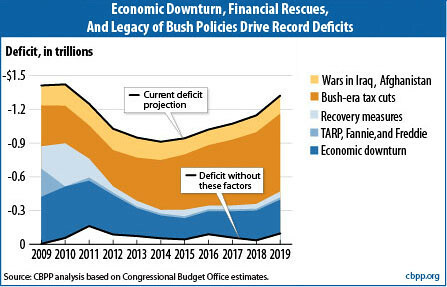 And keep in mind that this chart doesn't show the negative impact of Bush's unfunded Medicare part D, nor the positive impact of the Affordable Care Act. Extending Unemployment Insurance would barely register on this image. Hat tip to Simon Charlow for a link to the graph. McConnell is a bought and paid for guy and I'm from the state he's elected from. Notice I didn't say he was representing us.